The Department of Electrical Engineering at the Indian Institute of Technology Kanpur in association with the BSNL IITK Telecom Centre of Excellence (BITCOE) is organizing a three day Short Course titled "Detection Theory for Communications and Signal Processing" from 27th to 29th April,2015. This Course is intended for practicing wireless system engineers, graduate students pursuing research in wireless communications and teachers of engineering Colleges and personnel from R&D organizations. It is aimed at providing the participants with an in-depth exposure to state-of-the-art Detection theory aspects such as Maximum Likelihood (ML),Bayesian Detection,Generalized Likelihood Ratio Test (GLRT) etc and their applications in spectrum sensing and wireless sensor networks. 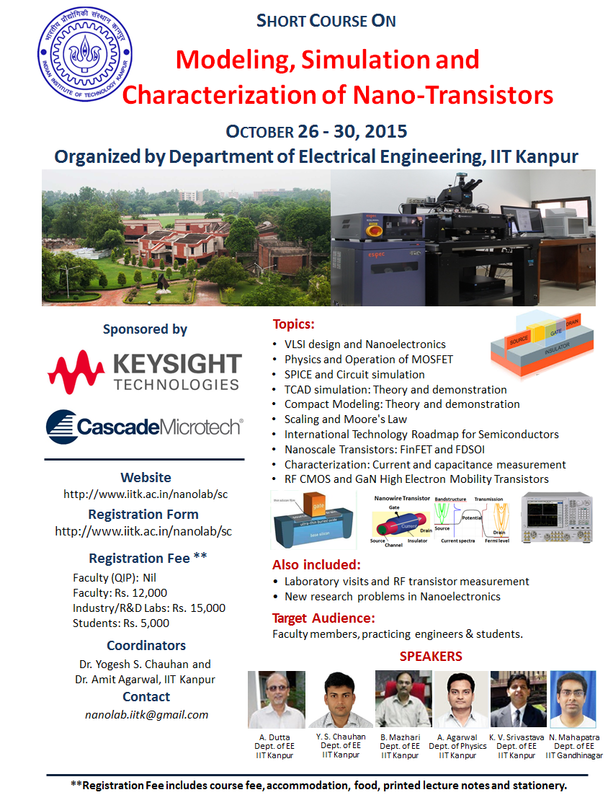 Department of Physics jointly with Department of Electrical Engineering, IIT Kanpur is organizing a short course on “Fundamentals and Applications of Metamaterials” between April 06 and April 10, 2015. The course is designed to cater the needs of teachers from Science & Engineering Institutions, scientists from R & D labs and practicing engineers from industry working in area of Metamaterials. It aims to equip the participants with an essential knowledge of the area so as to enable them start working with metamaterials in their research & applications. "Every year 15 to 20 Interns from different institutions undergo training program at TCOE India. They are given projects based on current challenges and requirements of the industry and also organise visits to many of our associated organisation which gives them wide exposure to the Telecom industry ecosystem".